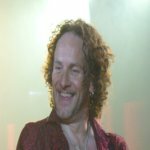 Def Leppard guitarist Vivian Campbell went back to his home city of Belfast over the weekend and played live in a bar with an old band mate. Vivian played a version of the Thin Lizzy classic 'Whiskey In The Jar' with Ray Haller of his first band Sweet Savage. Photographer Mark Hylands posted a photo on his facebook account as well as tweeting about the surprise appearance. Follow the link included in his tweet below to view the black and white photo. Sweet Savage also announced recently that they will be supporting Last In Line at all four UK shows. Vivian guested at two of their shows in Dublin/Belfast in mid 2011 just as the Mirrorball tour kicked off. The first time he had played live with them since leaving the band for DIO in 1982.